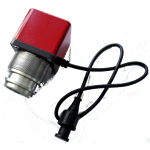 TS Sensor SVG-2.1 manufacturer – TS Sensor. This modification is intended to determine the loading vehicle with an accuracy of better than 7%. The system consists of two or more clearance sensors and control unit. The sensors are mounted on the frame on each vehicle axle to reduce measurement error sensors are located near each wheel. The distance between the frame and axle or between the frame and springs. Information from each sensor (clearance function) is passed to the control unit, where the data is analyzed and processed. At the output of the control unit are formed corresponding to the output. Connecting the GLONASS / GPS navigation terminals and monitor upload by one of the output of the control unit.